Two years ago, Lauren Jortberg found out she is one of the fastest young skiers in the world. Lined up against a field of world cup ready athletes at the 2017 world junior championships in Soldier Hollow, Jortberg cast aside her doubts and flew like an eagle around the classic sprint course on her way to a 20th place finish in the prestigious event. Today, she hangs with Canadian Olympians Dahria Beatty and Emily Nishikawa, her new teammates with the AWCA, as they push for grand world cup goals. 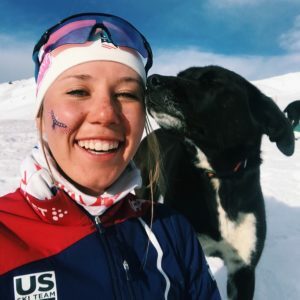 The Colorado native chose Canmore as her training base for the upcoming season, as she attempts to find an edge within a field of deep American skiers. “The biggest drive to join the AWCA is the environment and outdoor training available here. I had really no idea what I was getting into. I had never been to Canmore before. I had no idea what it would be like. But since I’m from Colorado, I wanted to go to the big open skies and mountains in the west. I feel like I’m at home in those environments,” Jortberg said. It was a gamble for Jortberg. 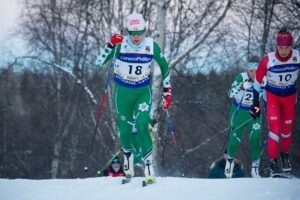 She had a 14th place qualifier at the U23 world championships last year while training with the University of Dartmouth, but decided she wanted a change. After meeting AWCA coach Chris Jeffries last winter at the Silverstar races, she began to consider a return to the Rockies. She checked with other skiers, checked the results, and decided the program would be a good fit. “This is the most gutsy thing I have ever done. I didn’t know anyone here. I know they had Frozen Thunder, so there is snow in October – and a good group of girls to train with. I had heard only good things about the coaches, so I decided to do something I’ve never done before, and it’s been awesome,” Jortberg said. She’s been blown away by the training environment thus far, and the endless number of ski partners she’s found. She’s also getting a chance to learn another language. It’s a skill she’s decided to embrace. Jortberg will stick with the Alpine Insurance AWCA until January, when she will return for her third year of University in Dartmouth, but she has some big goals to attain along the way. “I would love to be selected by the US for world cup finals in Quebec. That’s the best outcome for me. I’m also looking to improve my classic skiing. I’m a pretty strong skater, but classic I need to improve, so I have technique goals, but the focus right now is on having fun and enjoying the moment,” Jortberg said.